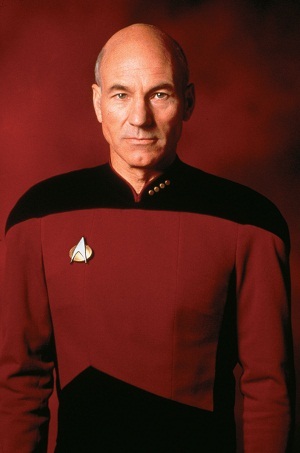 In the mid-1990s, I had a love affair with Captain Jean-Luc Picard. Just divorced, living in Boston, I was bumbling around in chaos. Money had me squeezed tight and I was up to my eyelashes in debt. Then one afternoon, a whole division of our publishing company (more than fifty of us), got laid off. With no job prospects in Boston, this life-long New Englander was considering a move to Charlottesville (wait, what state is that in, again?). I felt like I had no solid ground under me – like I was reeling in space. It’s no wonder that I fell in love with Captain Picard, the lead character on Star Trek: The Next Generation. Jean-Luc, with his strapping red uniform and his sage baritone, would gaze serenely from the bridge into the abyss of space. I waited expectantly for every episode, ready to soak up his self-possession. I craved his wisdom, his kindness, and his calm. Especially that down-to-the-core calm. Just about everything can get me bundled into a bunch, and it was especially so then. If my boss asked me to take on an extra project, if I didn’t sleep well, if someone didn’t like me, or if the store didn’t carry that goat cheese I wanted, I got my undies all in a twist. Jean-Luc, on the other hand, could be considering inter-galactic warfare, single-handedly saving an entire society, or (most terrifying to me) be trapped in an airshaft with a gaggle of 7-year-olds, and he always kept cool. I wanted some of that. I don’t know if Captain Picard had any practices that kept him so steady, but two things help me keep calm(er) these days: breathing and sensing my body. When I’m flipping out about something, my lowest, lizard brain is narrowing my perspective to fight, flight, or freeze. Instead of reacting from this primitive brain, I’d rather respond from the larger, more evolved prefrontal cortex, the part that allows reasoning, language, and communication. Neuroscience demonstrates that the best way to get my prefrontal cortex on-line is to sense my body. Not coincidentally, breath and body mindfulness are essential parts of yoga and Nia: put the body and brain under stress and then breathe and sense what’s happening. In yoga, my teachers repeatedly remind me to keep breathing calmly while I’m in the poses, even if that breath is not deep. Nia teachers say, “Everybody sense your (body part)” with the intent of bringing participants into their bodies and their higher brains. You can do it right now, sense your breath and your body and immediately you are tapping into the prefrontal cortex! I’m glad it’s Jean-Luc who’s in charge of keeping peace in the universe. If it was me on the bridge of the Enterprise and some alien aggressor approached with phasers a-blazin’, I’m guessing I would get worked up in a hurry. But presented with the more basic stresses of life (bills and relationships and climate change and sequesters), I am grateful for my breath and awareness that help me make skillful choices and enjoy the ride.